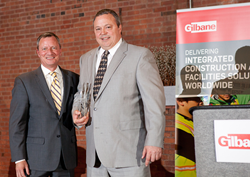 On April 14, Controller Grant Goebel was recognized at Gilbane’s annual Business Unit dinner as the 2016 recipient of the Greg Honzo Core Values Award. This award was instituted in Greg's name to honor the Cleveland or Columbus Business Unit employee who illustrates Gilbane's Core Values with their professional and personal lives and who continually exceeds expectations through their dedicated service to the company. Grant Goebel has been in the construction industry for more than 28 years and joined the Gilbane team in 2007 as a controller. Grant was named Vice President in 2009 and has an MBA in business administration from the University of Missouri. Grant is a dedicated leader who exemplifies honor and integrity in every aspect of his life. Over the years, he has been committed to a one company approach and is always quick to lend a helping hand to other offices and even take on international assignments. The Core Values Award was created to honor Greg Honzo who was a project executive in Ohio and loyally served Gilbane for more than 25 years. Greg passed away in September 2007 after a three-year battle with breast cancer. Gilbane provides a full slate of construction and facilities-related services – from pre-construction planning and integrated consulting capabilities to comprehensive construction management, close-out and facility management services – for clients across various markets. Founded in 1873 and still a privately held, family-owned company, Gilbane has more than 50 office locations around the world. For more information, visit http://www.gilbaneco.com. Gilbane has been providing construction management services in Ohio Since 1959 and has served clients including the Ohio Facilities Construction Commission; Cleveland Clinic; University Hospitals; Cleveland State University; Kent State University; Cleveland Indians; Lakeland College; The Andersons; Cuyahoga Community College; MetroHealth System; Goodyear Tire & Rubber Company; Battelle Memorial Institute; The Ohio State University; Grange Mutual Insurance; Marathon Petroleum Corporation; Nationwide Children’s Hospital; Franklin County and Columbus Regional Airport Authority. Gilbane is an active participant in the ACE Mentor Program, Rebuilding Together, Ronald McDonald House of Central Ohio, The Center for Family Safety and Healing, United Way, I Know I Can, Providence House and Greater Cleveland Partnership.